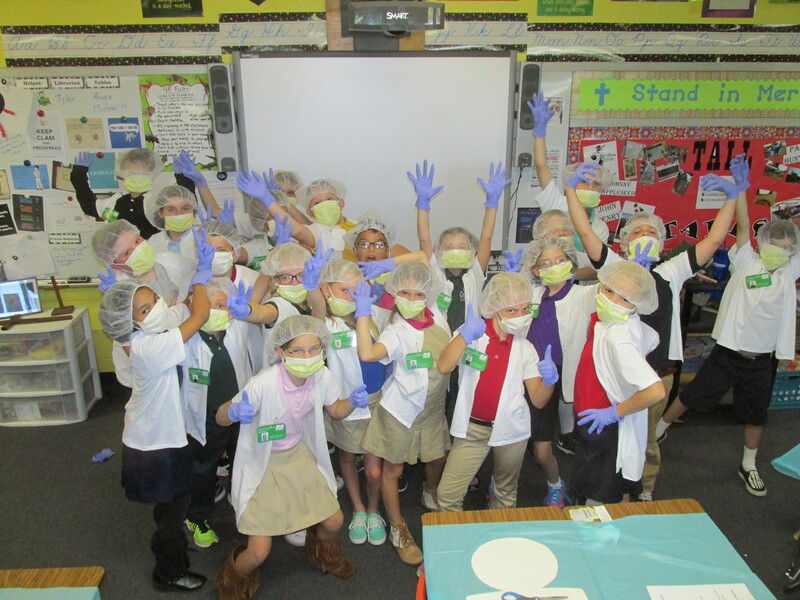 Yesterday, the 4th grade classes hosted a Fashion Extravaganza! Outfits were created from some of the most mis-matched pieces of clothing we could find. 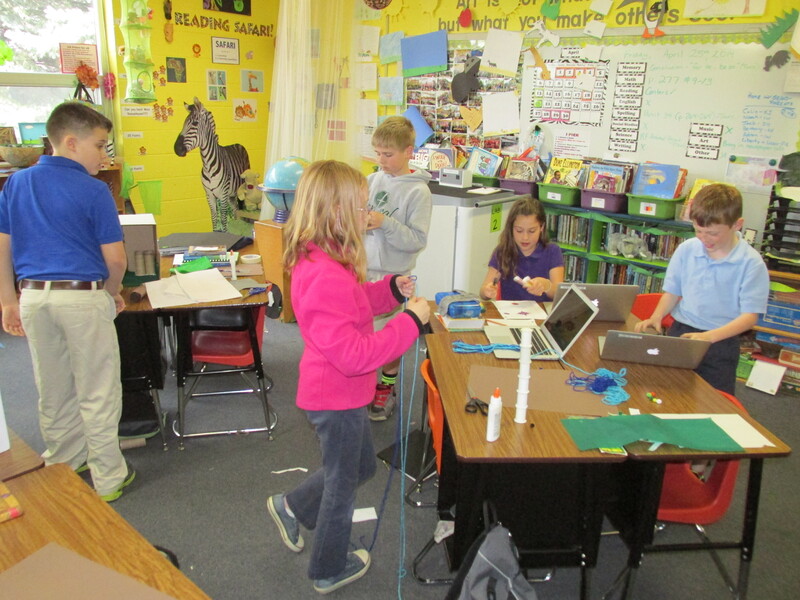 Then the students worked together to write creative descriptions of the clothing, in order to make it sound like the next greatest fashion trend. Below is a video of our Fashion Show. Our crowd was very enthusiastic, so a few descriptions are difficult to hear, but the students did an awesome job with this project! And, let’s face it…they look fabulous! Are You Ready for Some Football!!??! This past Wednesday, we had an entire day devoted to one of my favorite sports: football. 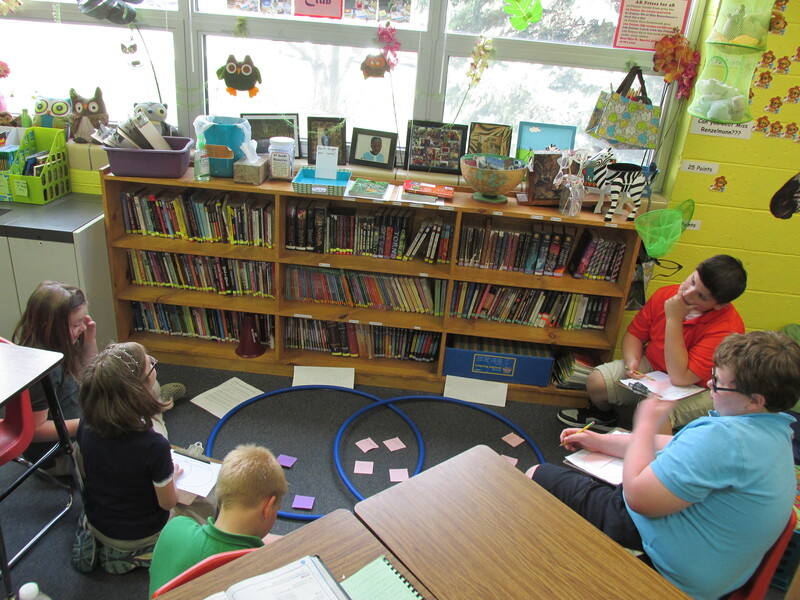 The students walked in to our classroom in the morning to find it set up like a football stadium. 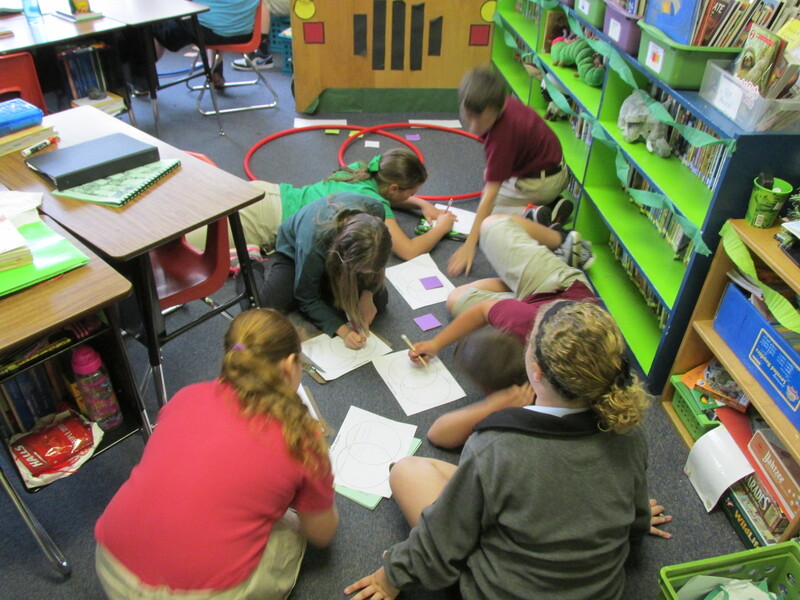 Our first activity was a football-style review game for an upcoming Math test. 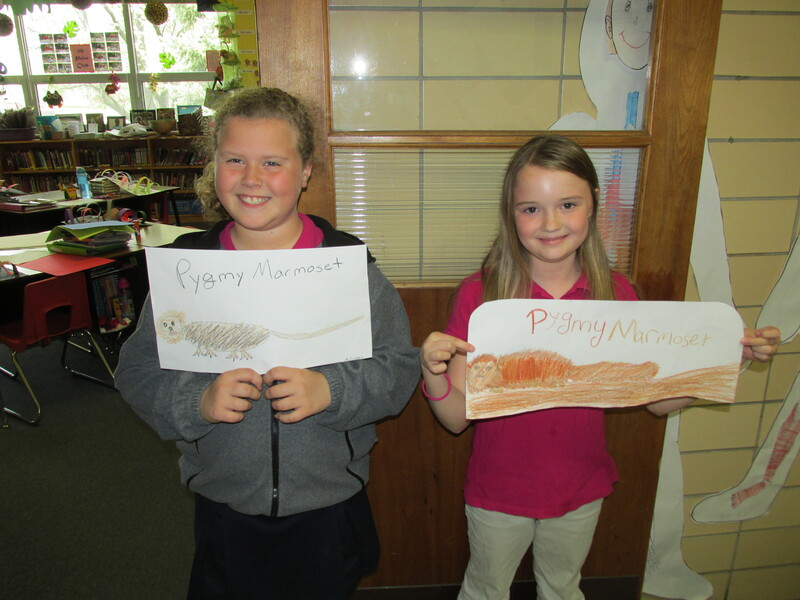 The questions were displayed on the SmartBoard, and students answered them on their own dry erase boards. If they got the correct answer, they advanced one yard line. If they did not get the correct answer, they stayed where they were. Any penalties would result in being sent back a yard line. (Thankfully, no flags were thrown in our game!) Questions were timed to keep the game moving. Students were on two teams, starting in opposite end zones. Once you reach the other end zone, you scored a point for your team, then turned around and worked your way back toward the other end zone. After our Math review game was finished, we did two sets of football-themed centers activities to round out our day, with roughly 20-22 minutes per station. Students were put into three teams for these, and competed as a team to complete all activities. 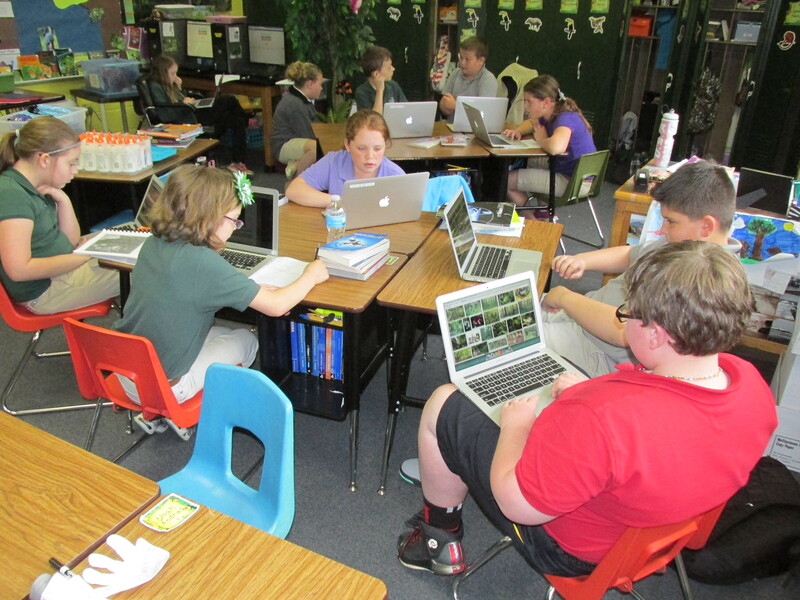 These centers covered many different topics across various subject areas, some new material, some review. 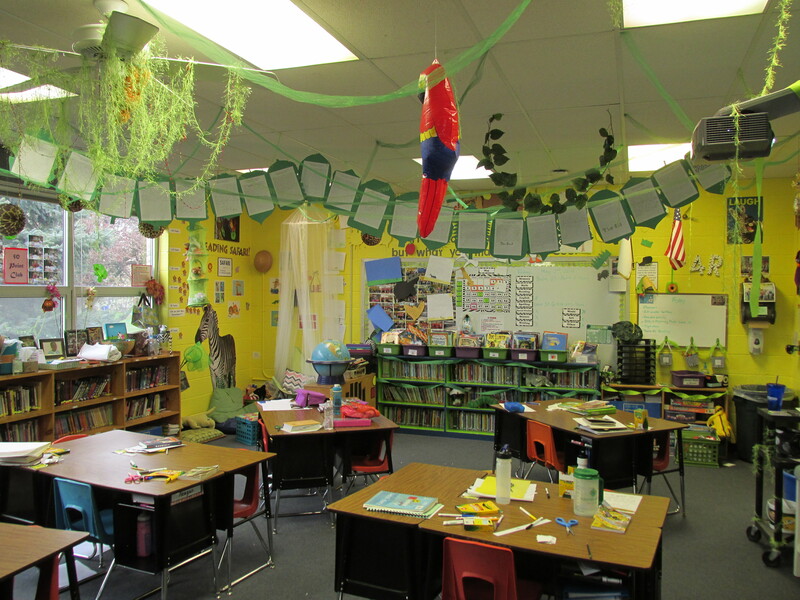 We had centers in English (idioms, types of sentences, onomatopoeia poem/story writing), Reading (fact/opinion, vocabulary matching), Math (measurement in inches and feet), and Social Studies (map skills). For early finishers, there were bonus Math word problems on the wall to solve for bonus points or additional long division practice for our upcoming test. There was no time to be bored during this day, and the time limits kept everyone on their toes!! Are YOU ready for some football??! 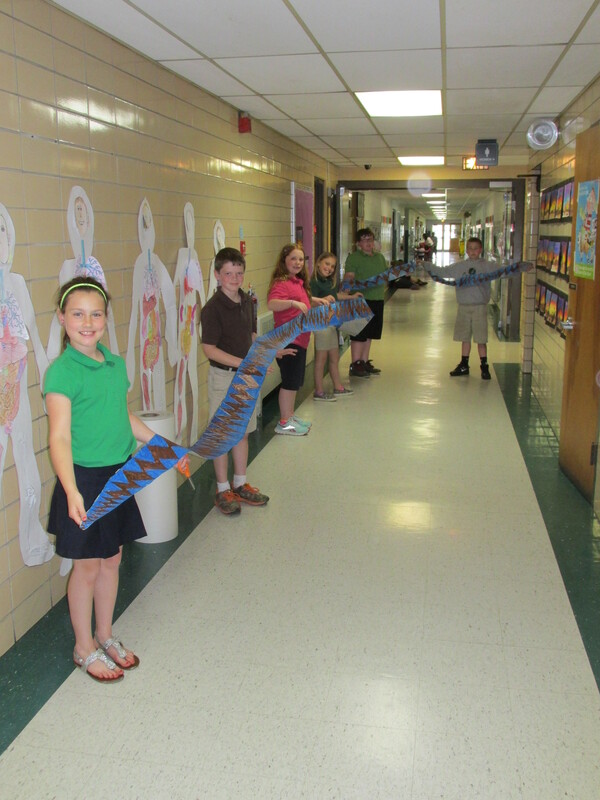 Pin the Snake on Medusa…hilarious game to watch and play!! Remember…if you look directly at her, you turn to stone!! 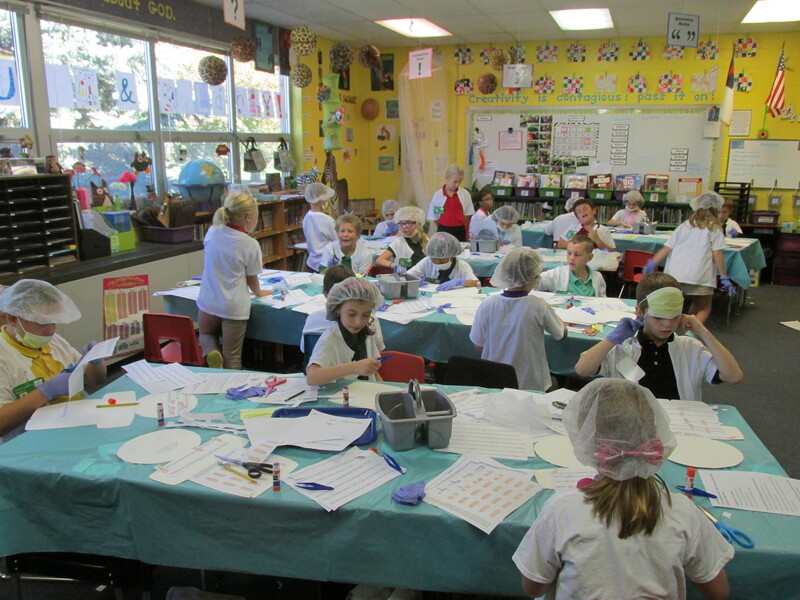 Some pictures from our Greek scenes. 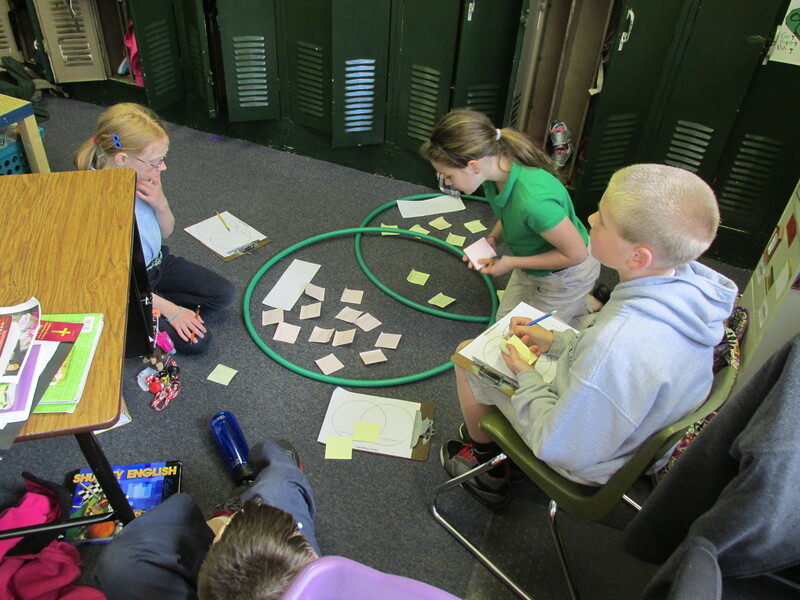 Students were put into groups, and each group picked a Greek myth we studied out of a hat. They then had to pick the main scenes from their myth, map out how they wanted to “illustrate” each scene, and then do the illustrations using themselves as the characters. All props, outfits, and accessories were created by the students with their groups. It was a fun (and messy!) project. Once we took pictures of all the illustrations, the next day each member of the group got to write a summary of what was happening in each scene. 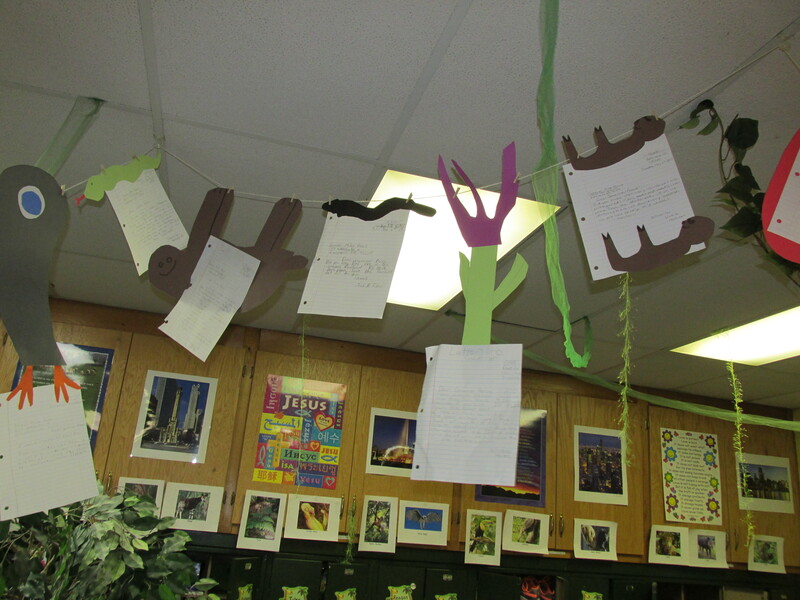 These summaries and the pictures were then put in order to tell the story of their myth. 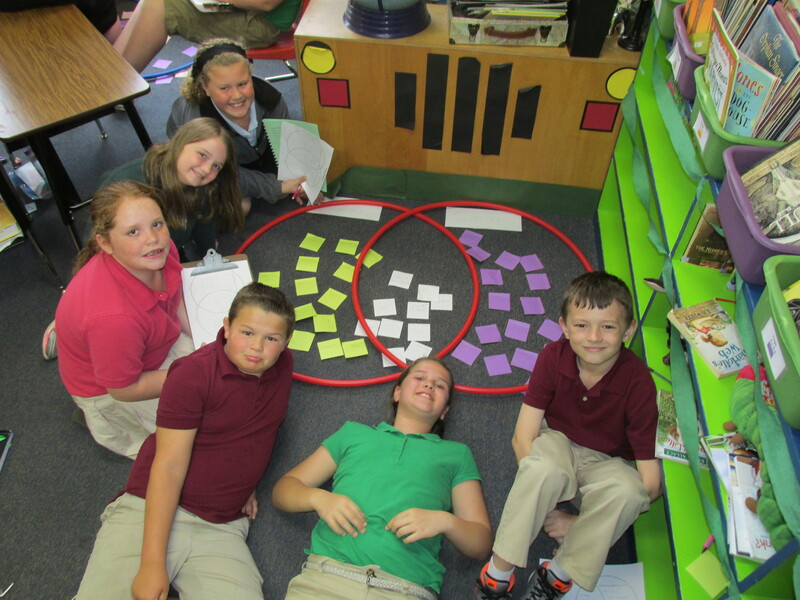 Summarizing skills, writing…and crazy messy fun! Good times. 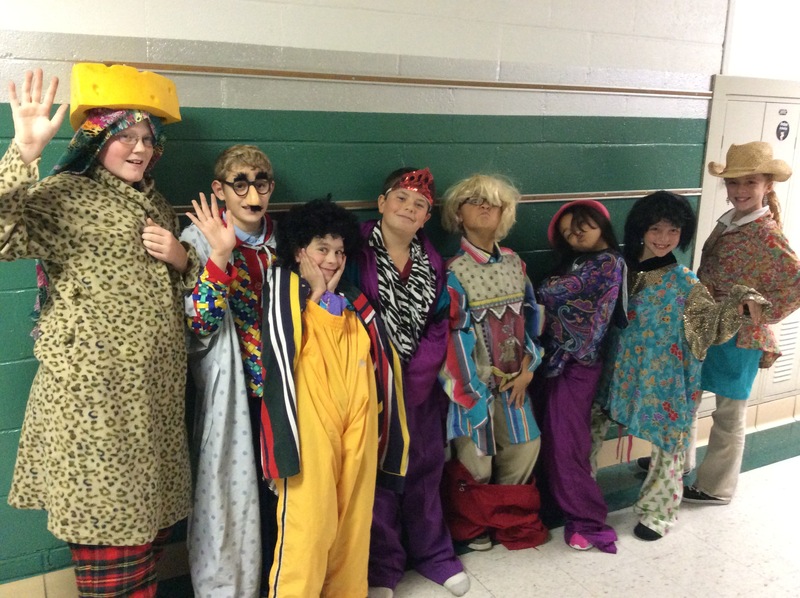 This year, 6th grade and 4th grade teamed up for the first time to hold a Fashion Extravaganza fashion show!! 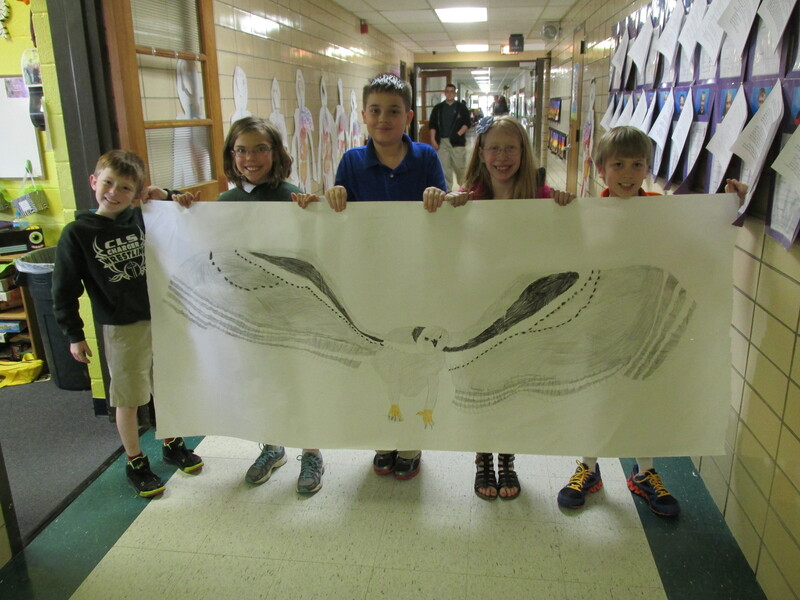 The idea behind this project was to work on our creative writing skills, specifically working with adjectives and figurative language. The students were put into groups. The first day’s assignment was to choose a model from each group, and create an outfit for that model- using the items we collected at the local thrift store. The more mis-matched the outfit, the better. Then, each student in the group was assigned to write a description of the outfit, making it sound like the most spectacular ensemble you’ve ever seen. Bits and pieces of each group mate’s writing was put together into one description for the group to use. Then, roles were assigned. Each group had a model, an announcer, a stylist, publicity team, music, paparazzi…everyone had something to work on over the next few weeks as we prepared for the fashion event. On the day of the Fashion Extravaganza, we converted our gym into a runway and invited other classes to come and see our work in action. The models and announcers did not disappoint, but my personal favorite part were our team of paparazzi, all armed with iPads to take lots of pictures. Here is a picture of our models, followed by a video of the Fashion Extravaganza. Enjoy! I know I did!! 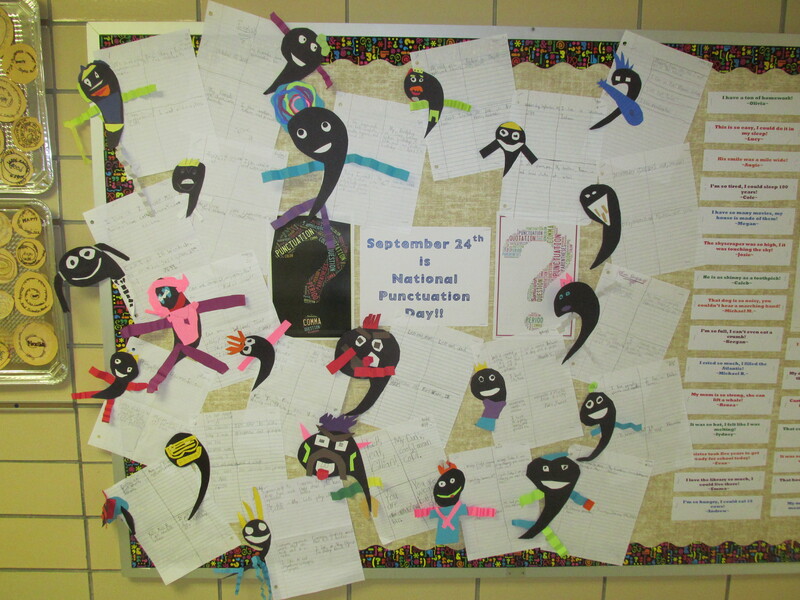 September 24th is National Punctuation Day. (It’s a real day!! I promise!!) 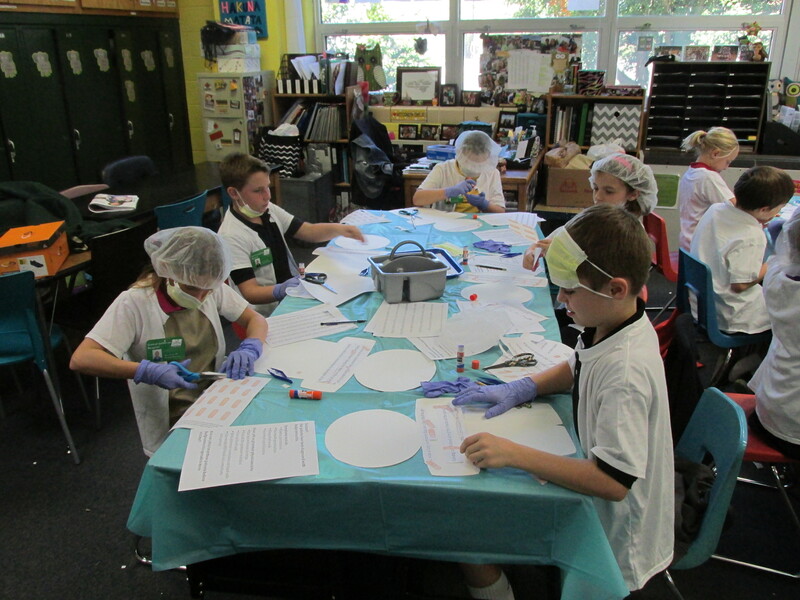 What better way to celebrate the day than with an all-English activity day. We learned about the value of the comma, made up sound effects for verbal punctuation, and attended to some sick grammarians who had a bad case of badgrammaritis. 🙂 All in all, it was a fun day!! Our first activity, Comma People, helped us review the importance of using commas. 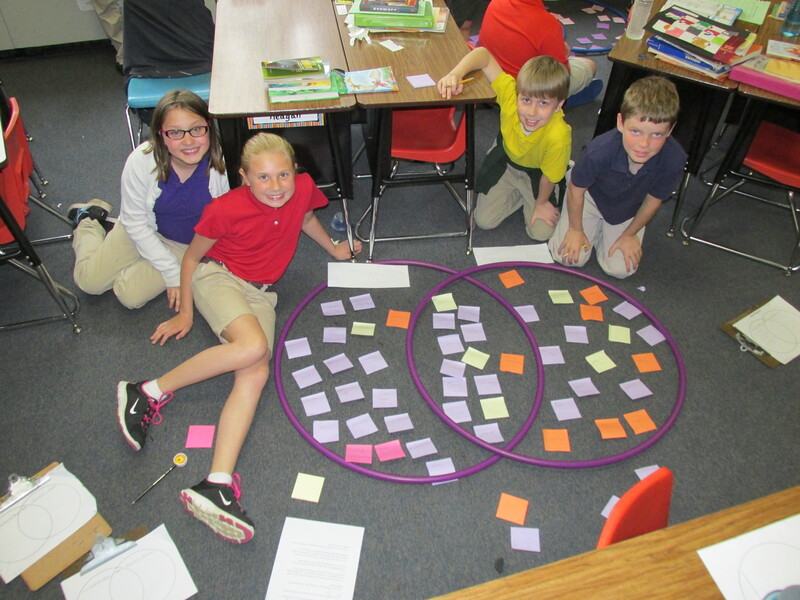 The students were to give 4 examples of proper comma use, and then create a Comma Person to go along with their examples. While the examples were great, the Comma People creations were even greater. Love the creativity! 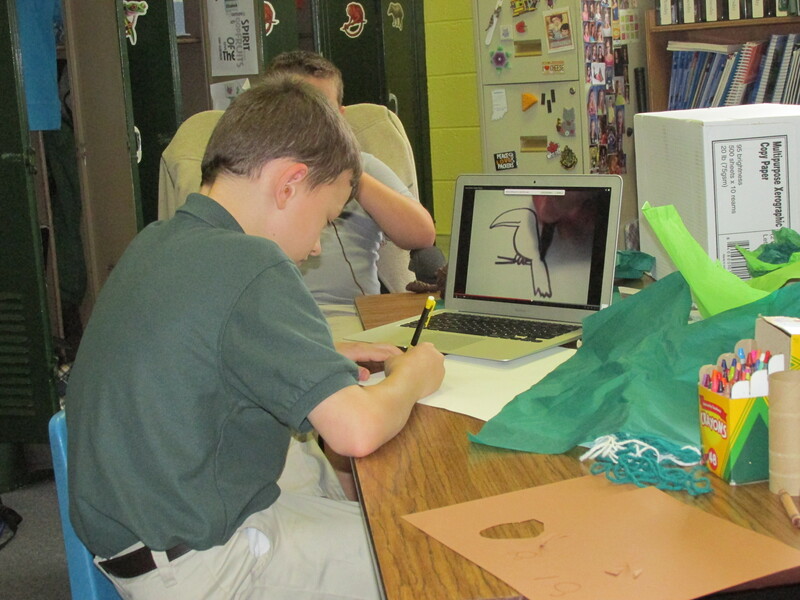 Our next activity took more creativity, but this time in the form of acting, reading, and sound effects. We watched a short video of Victor Borge, a comedian, performing his “Phonetic Punctuation” sketch. 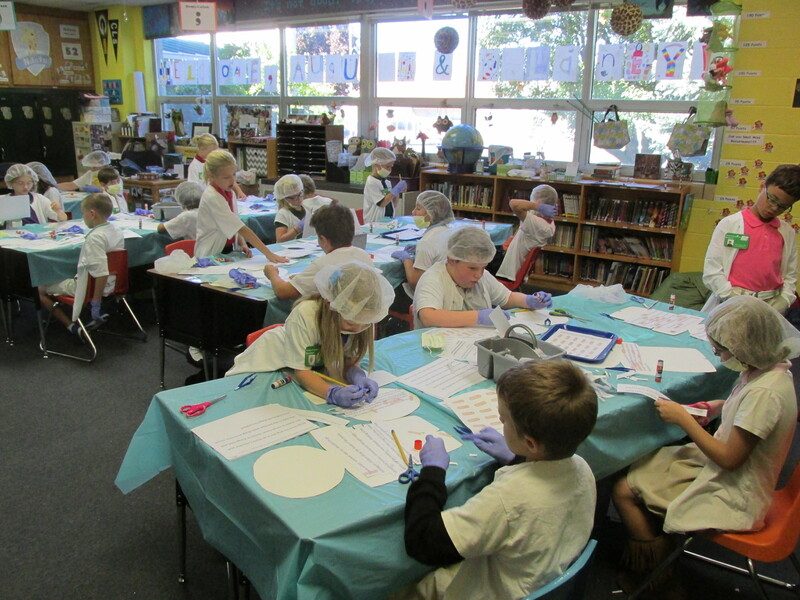 After watching his inspiration, we created our own versions, using the Elephant and Piggie books by Mo Willems. Here is the video of his sketch, and then the video of our interpretations. 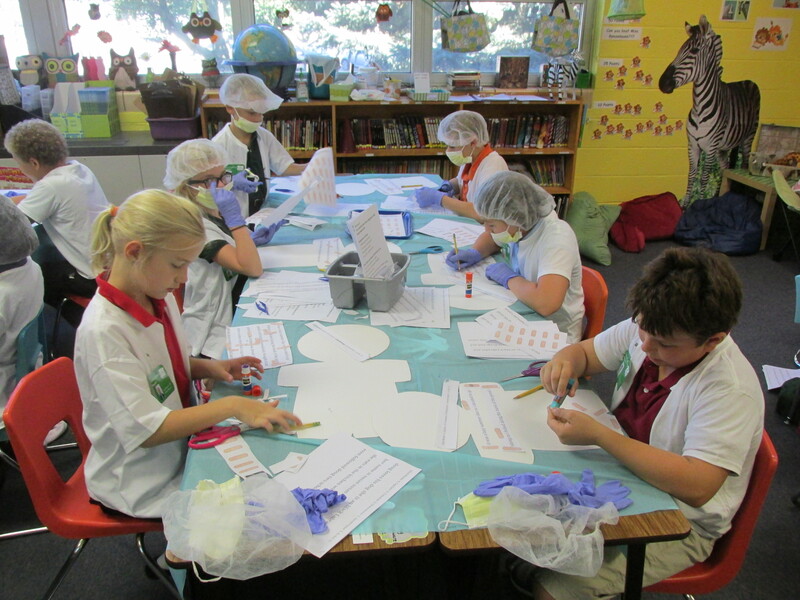 Our afternoon was filled with an activity we called Sentence Surgeons. 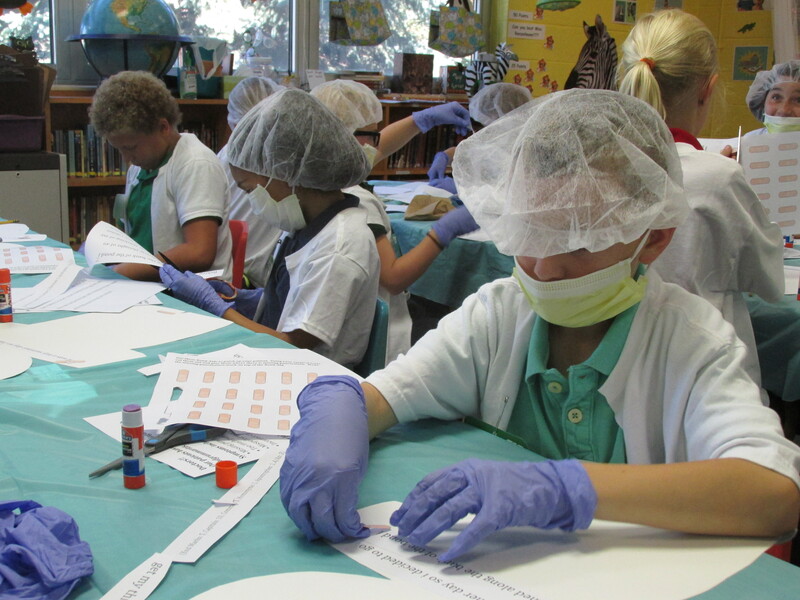 In this activity, the students dressed as doctors, and attended to sick patients who had a bad case of badgrammaritis. Their job was to repair the damaged grammar using bandaids, and hopefully not lose their patient in the process. We had a ton of fun with this activity. 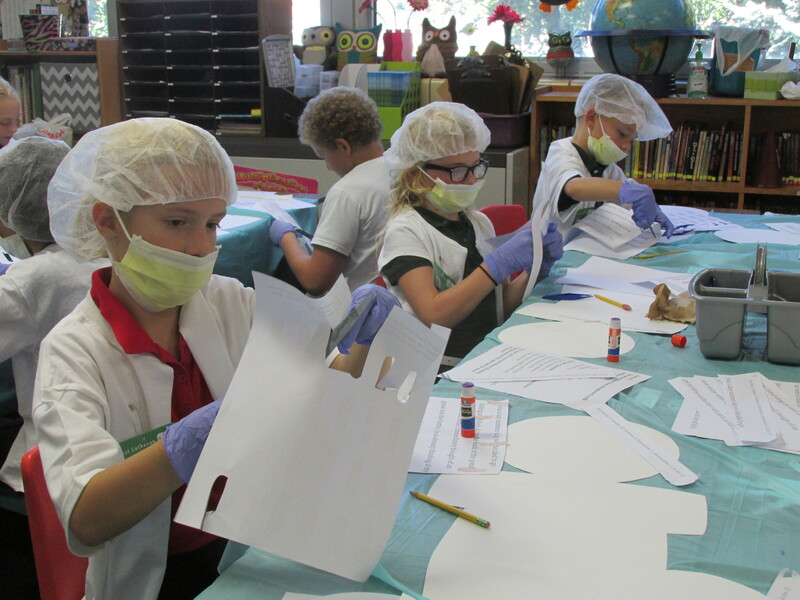 Tropical Rainforest Study 2014- Week 3!! So much has happened in our classroom since last week’s post! 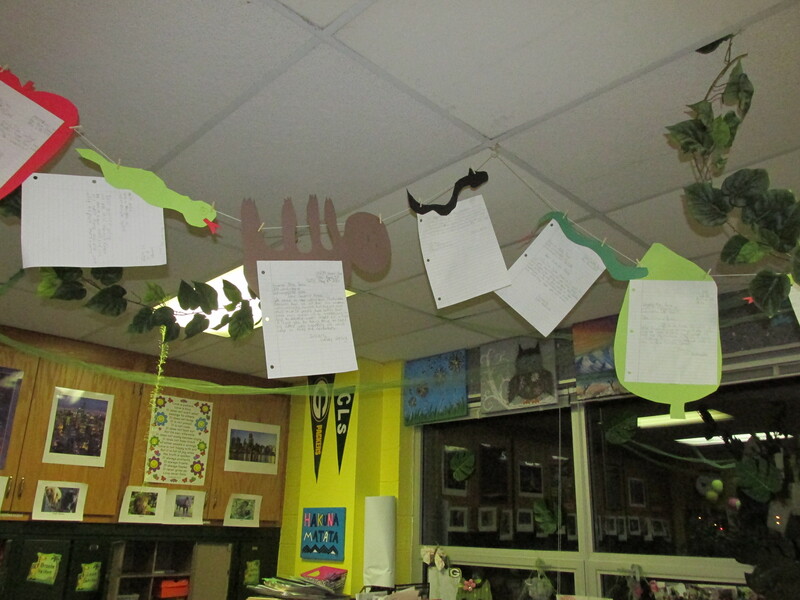 We have been hard at work, continuing our study of the rainforest. 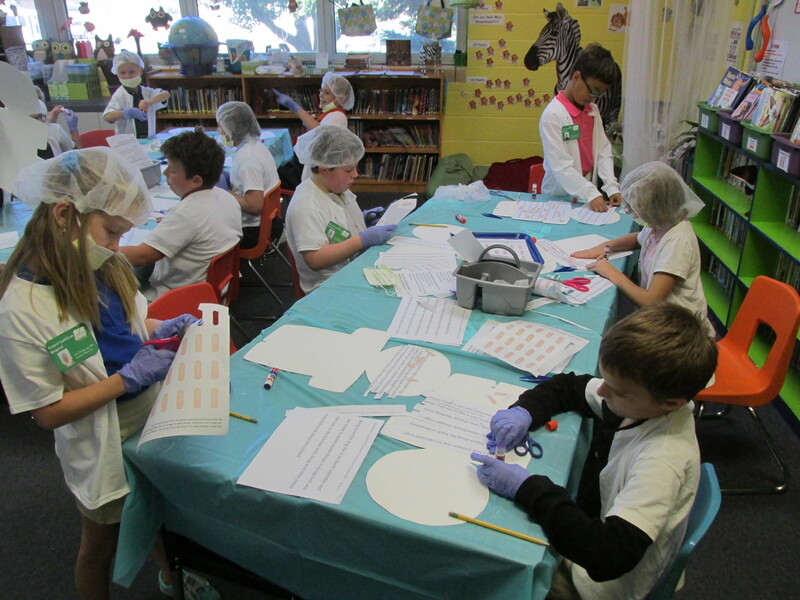 This week was full of activities that helped us further explore this amazing ecosystem!! 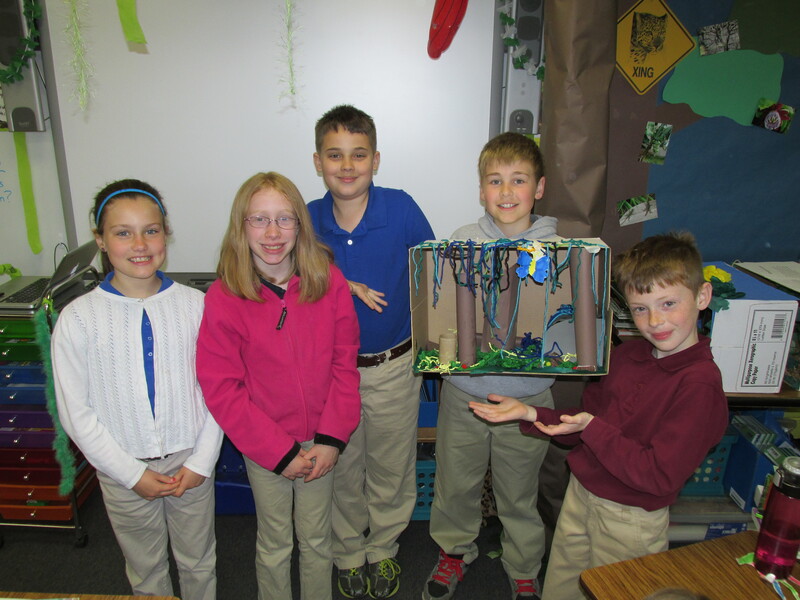 First up, our collages of rainforest products. 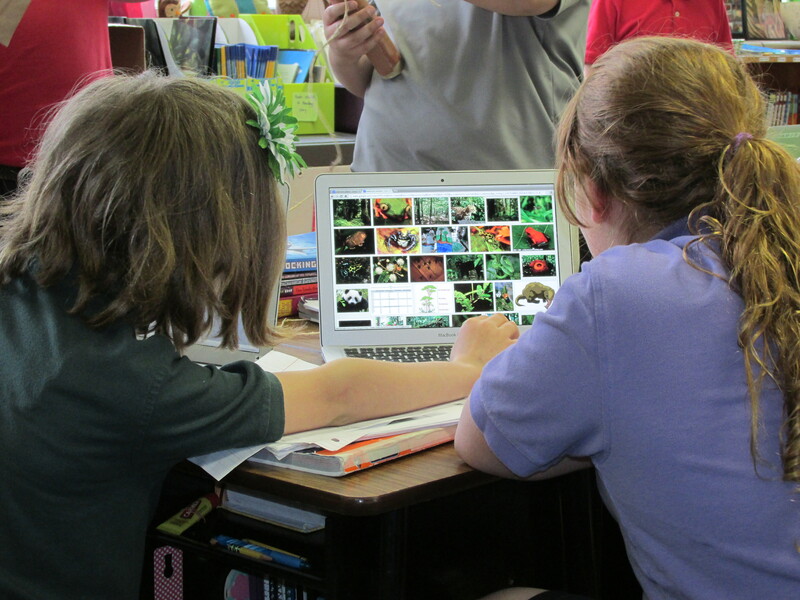 Students searched through ads to find medicines, foods, and other products that come from the rainforest. 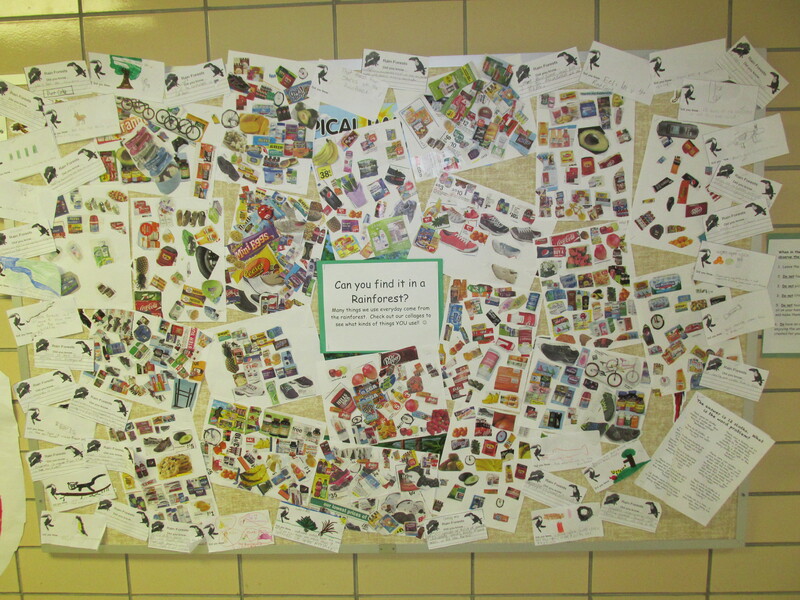 What an amazing array of items we would miss if our rainforests disappeared!! 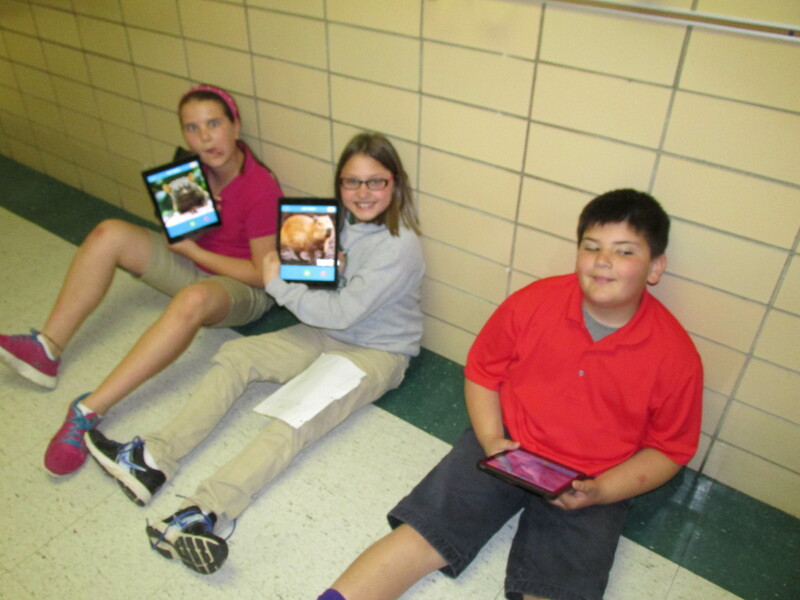 This week was also our first time trying out the school’s iPads. 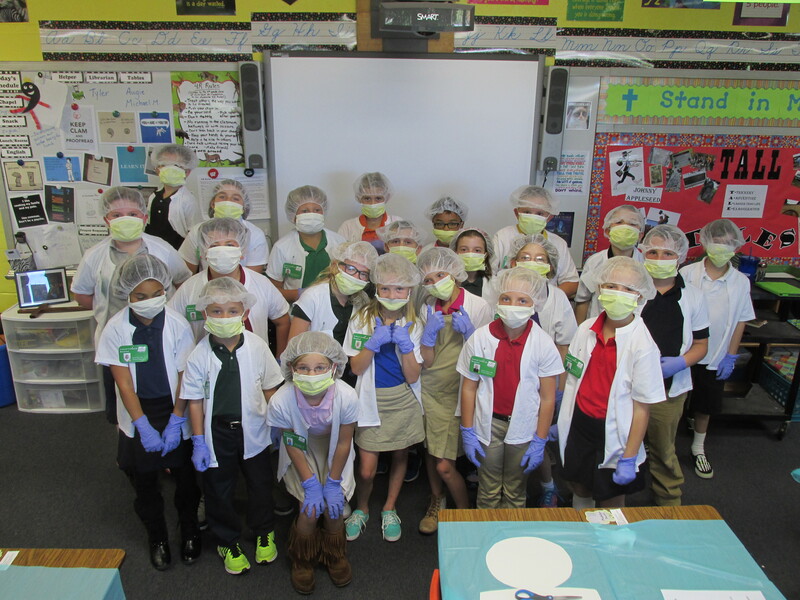 This was a LOT of fun, and the students were way better at using them than I was!! 🙂 We used a program called ChatterPix, where you have a still picture, but give it a “mouth” and record yourself talking. When it plays back, the “mouth” moves with your voice! Super cool. 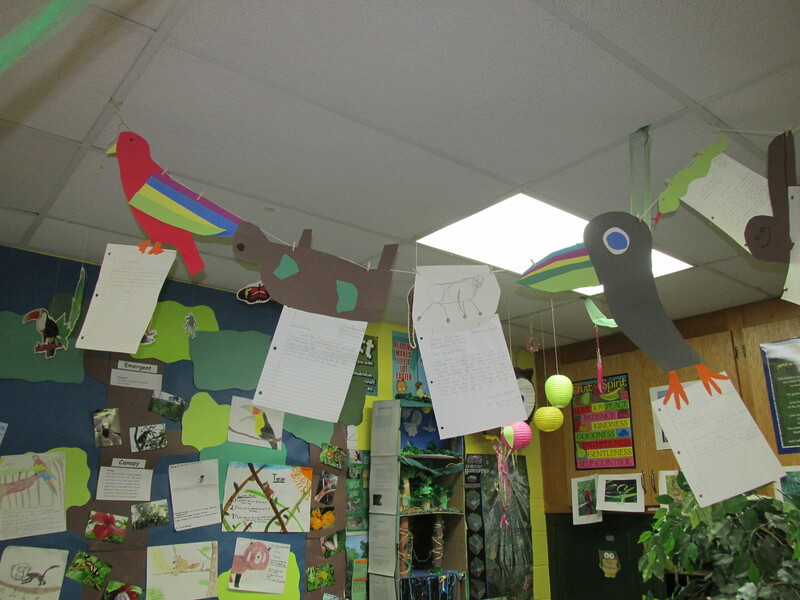 We told about our animals from our rainforest animal projects. 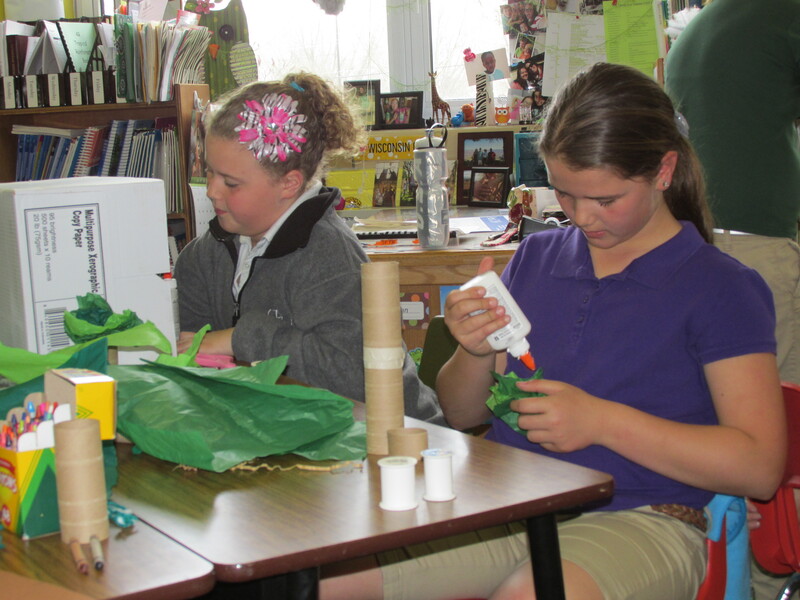 My favorite rainforest project is Rainforest Superlatives. 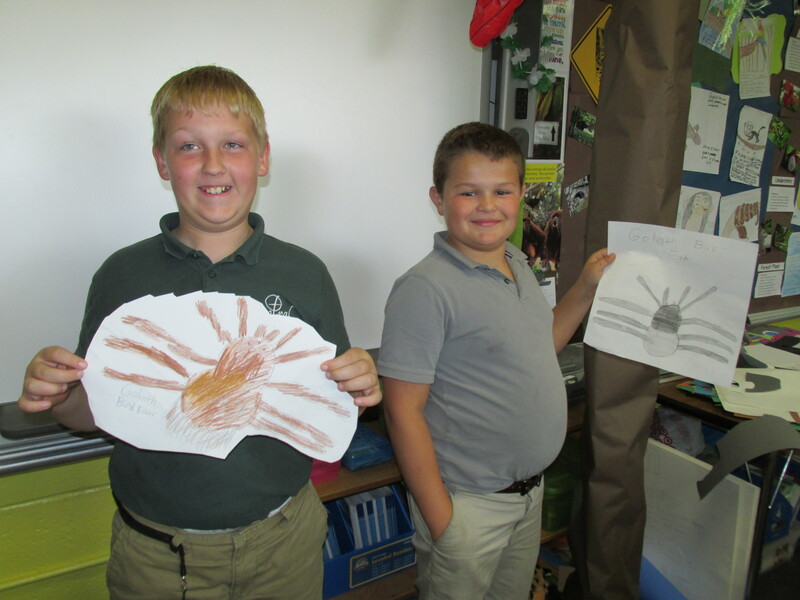 We talk about a few examples of rainforest plants and animals that are either extremely large or extremely small. 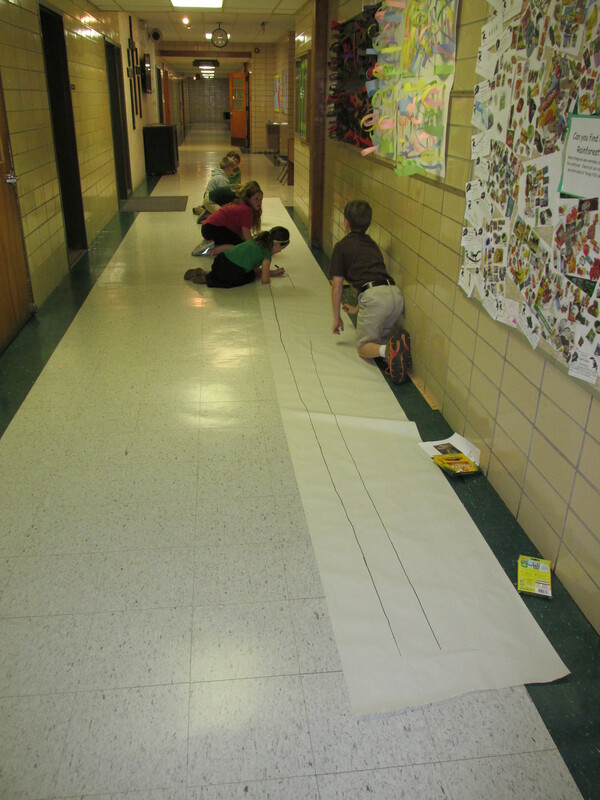 Then, using yardsticks and rulers, the students drew out each creature true to life size. 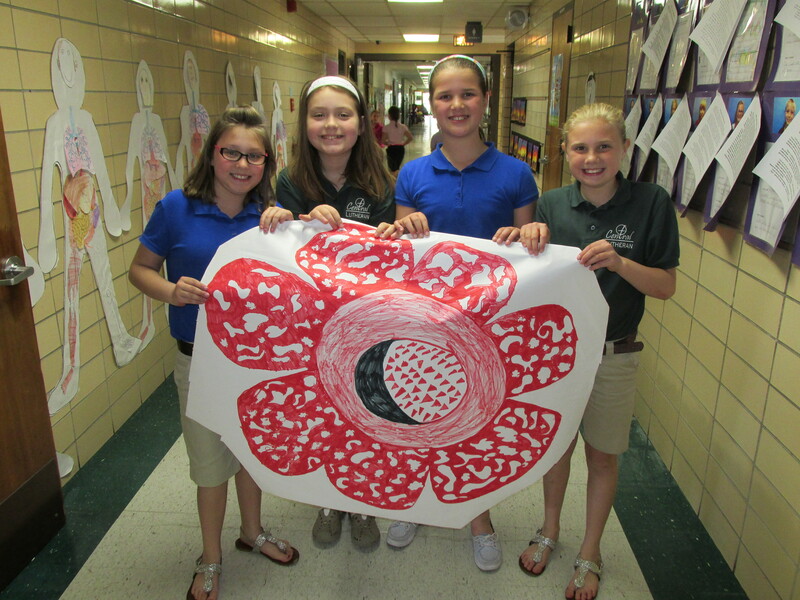 The Rafflesia Flower: the world’s largest lily, measuring up to 3 feet across! The Harpy Eagle: one of the world’s largest eagles, measuring up to 3 feet in height, with a 5 foot wingspan! The Pygmy Marmoset: the world’s smallest primate, measuring only 14-16 cm long with a 15-20 cm tail! The Goliath Bird-Eater: world’s largest spider, measuring an 11-inch legspan! The Reticulated Python: the world’s longest snake, measuring 32 feet, 9 inches in length! 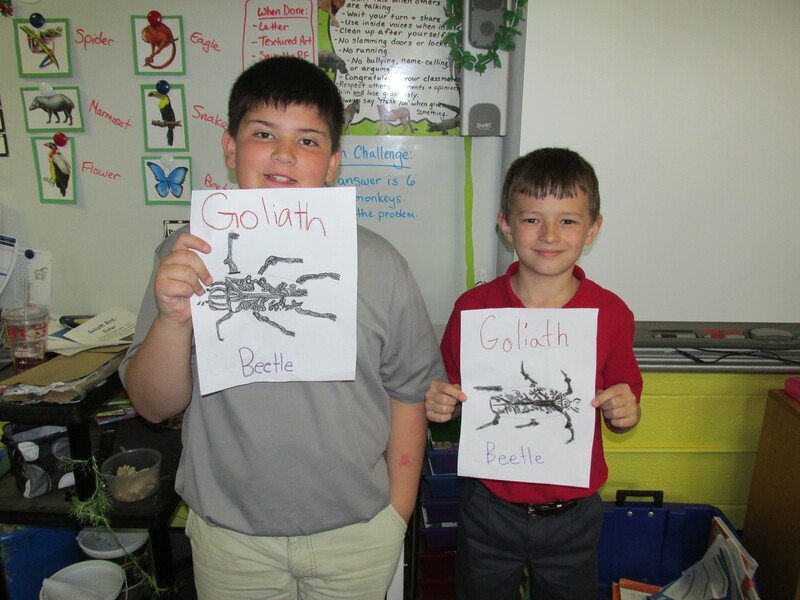 The Goliath Beetle: one of the world’s largest beetles, measuring up to 6 inches long! 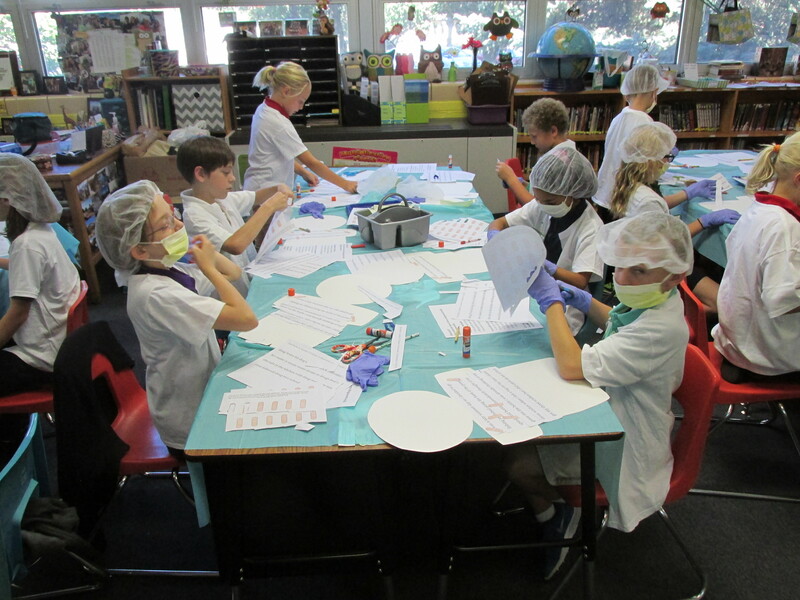 Our last project for the week involved some practice in letter writing. 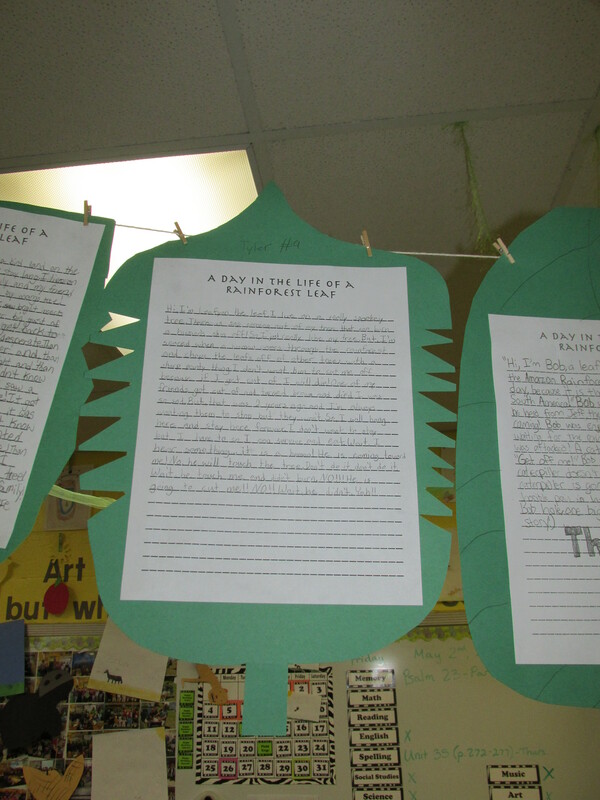 We wrote letters to our governor, asking him to help us save the rainforest! 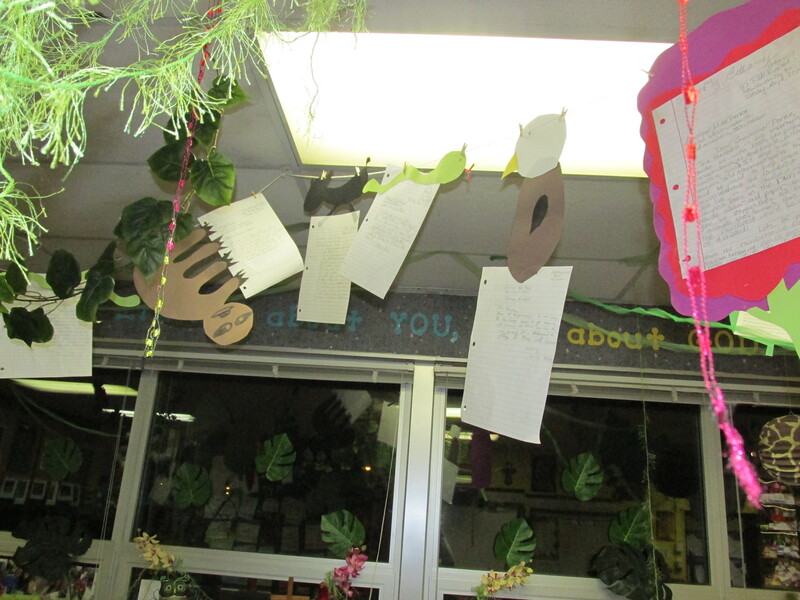 Each letter was then attached to a rainforest creature of their choice and added to our classroom rainforest display! Lots of great creativity with these!! Stay tuned for more fun projects coming up next week!! 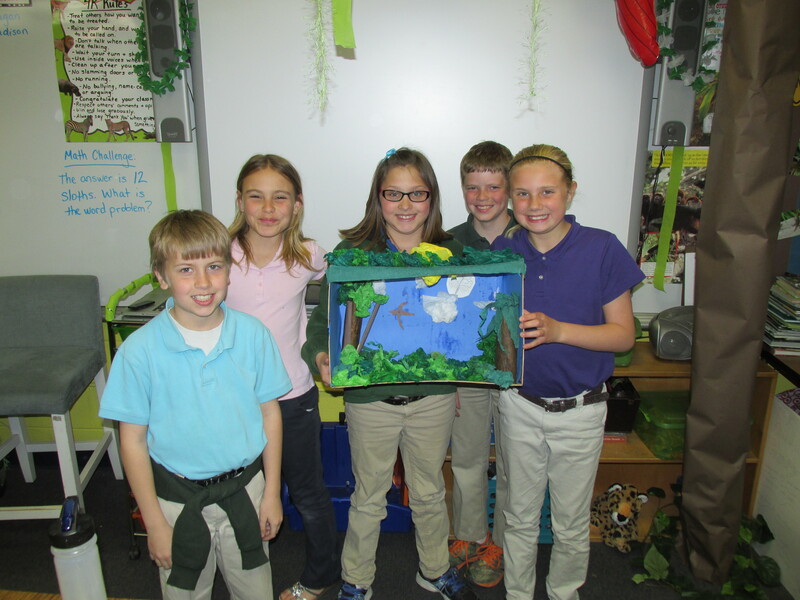 Two weeks ago, 4R began studying the tropical rainforest ecosystem. We have been exploring this topic in Reading and Science, and have even made connections in other subjects as well!! We have barely started in our projects and activities, but I thought that it would be nice to see what we’ve learned about so far. Here is what we’ve been up to in class for the last 2 weeks. 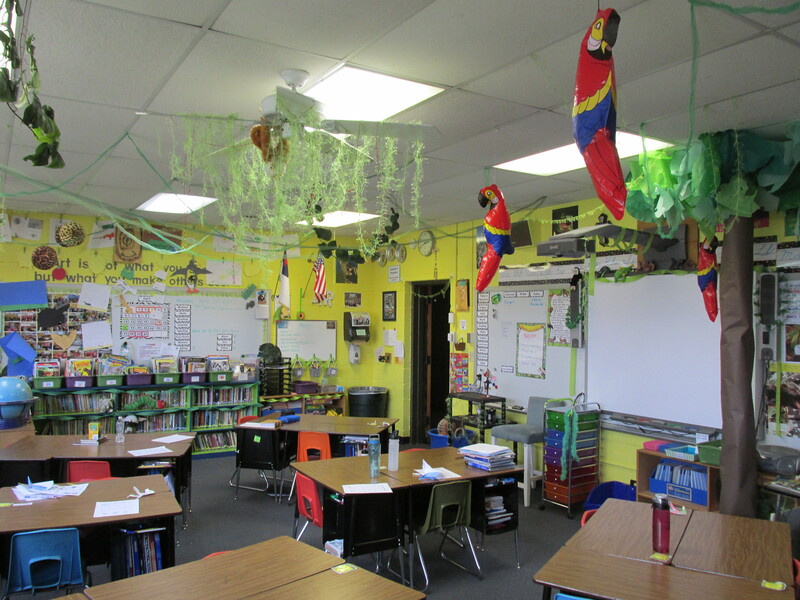 Our classroom took on a whole new look with this unit. We walked in last Monday to find that a tree had sprouted right in the middle of our room, and brought with it some vines and other plants. 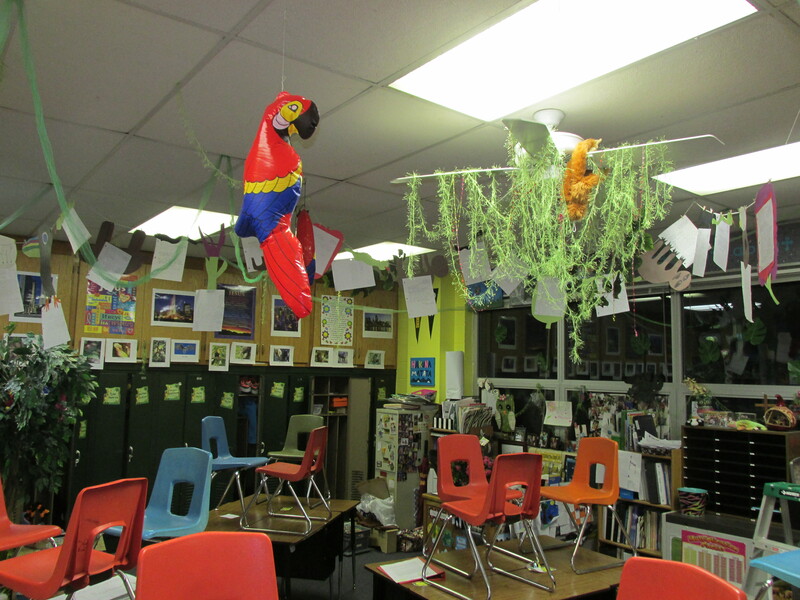 Then there were the animals…it’s a jungle in here!! 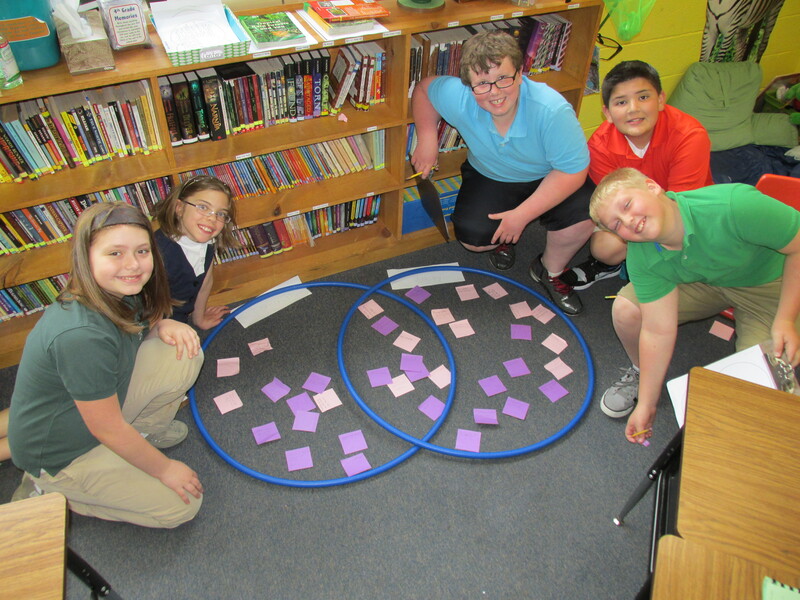 One of the most important things to learn and understand about the rainforest is that it is divided into 4 distinct layers. 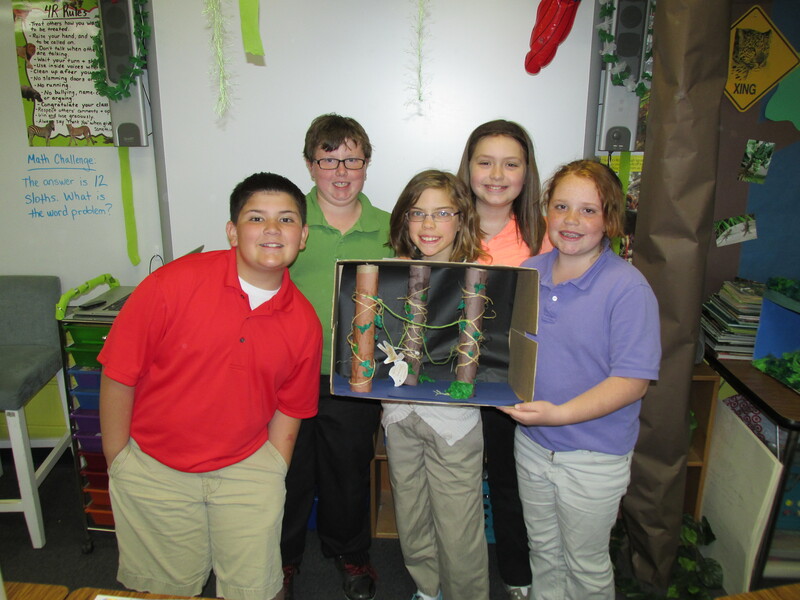 Each layer has different plant and animal life, and they are different enough to almost be their own ecosystems! 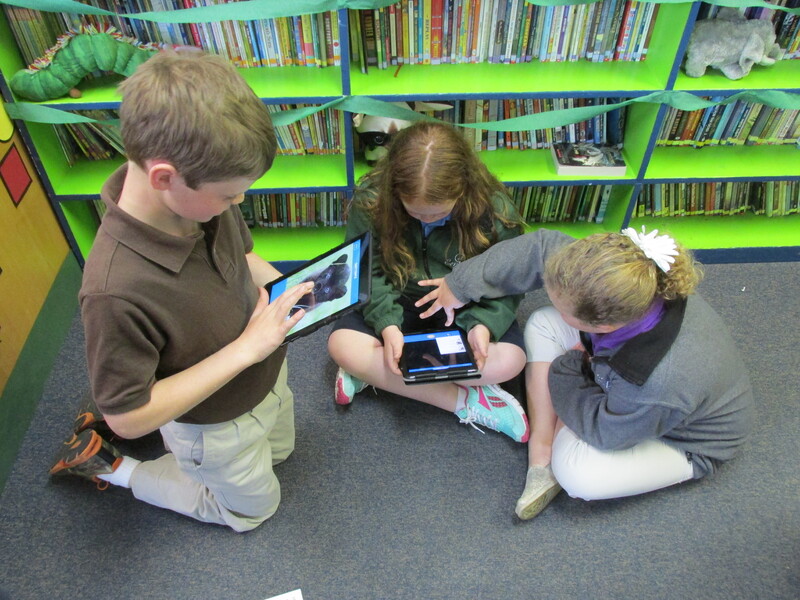 We broke into study groups and researched each of the layers in more detail. 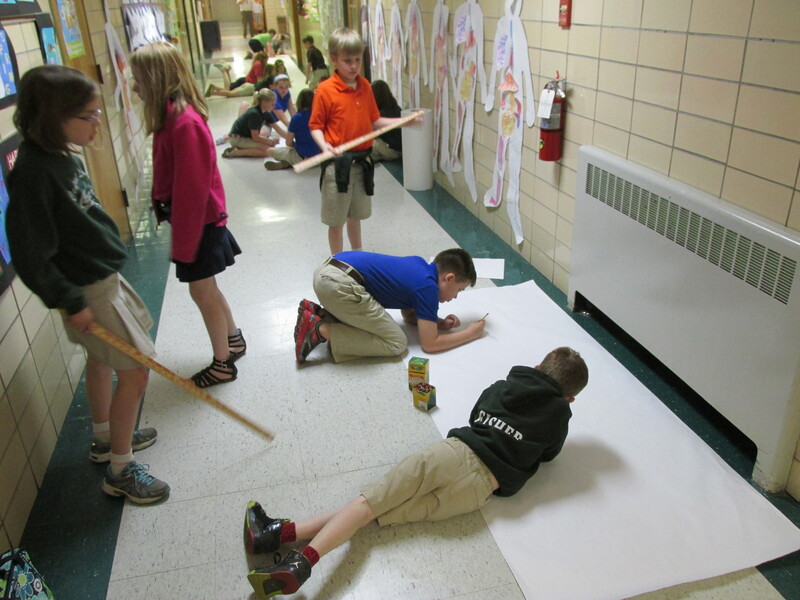 Once enough research had been collected, the groups worked together to make large dioramas of the layer they were assigned. 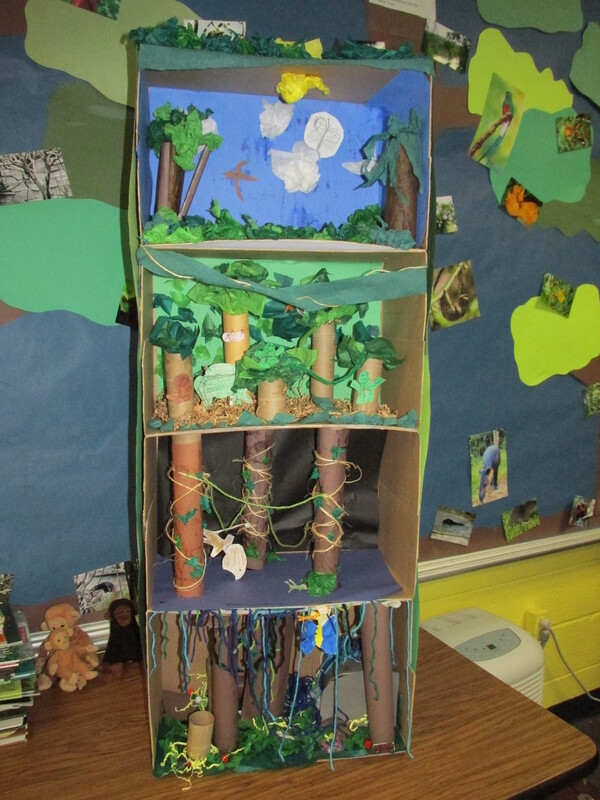 These dioramas were combined to make one large classroom display of the 4 layers of the rainforest!! 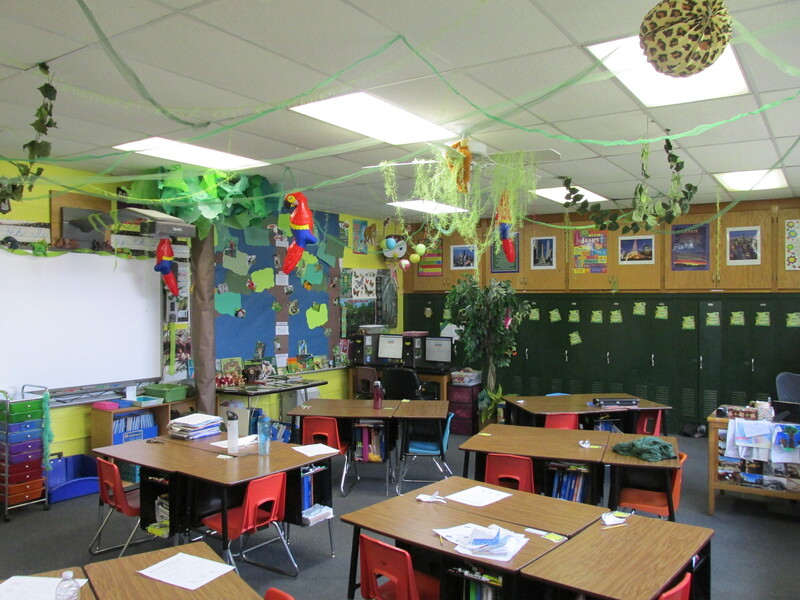 During our second week of study, we took one more opportunity to explore the layers of the rainforest (AND to review what Compare and Contrast means before the ISTEPs!!). 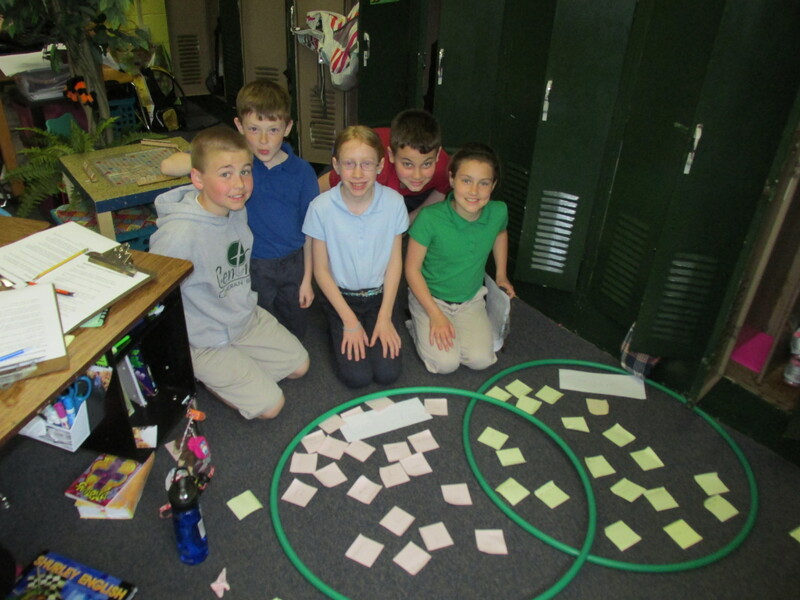 Groups selected two different layers of the rainforest and thought of the many ways that they were alike and different. 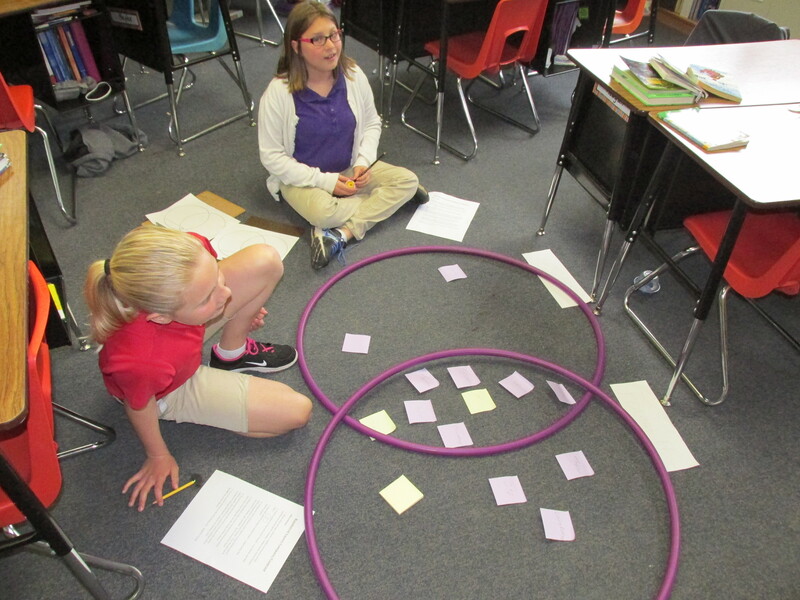 Using sticky notes and hula hoops, they compared the two layers in large Venn diagrams. 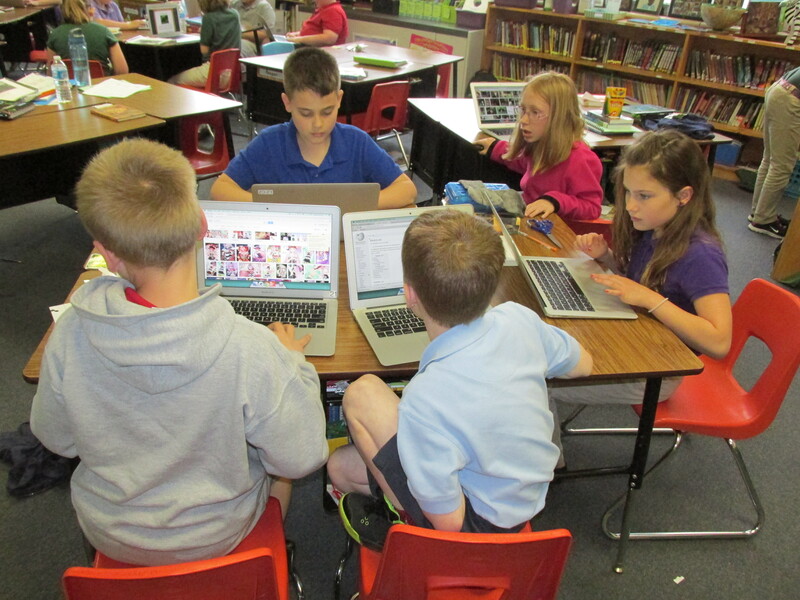 They were allowed to look for help on the computers, but most of the facts they were able to recall from our layer study last week (we used our research from the diorama project to help with this one, too!). 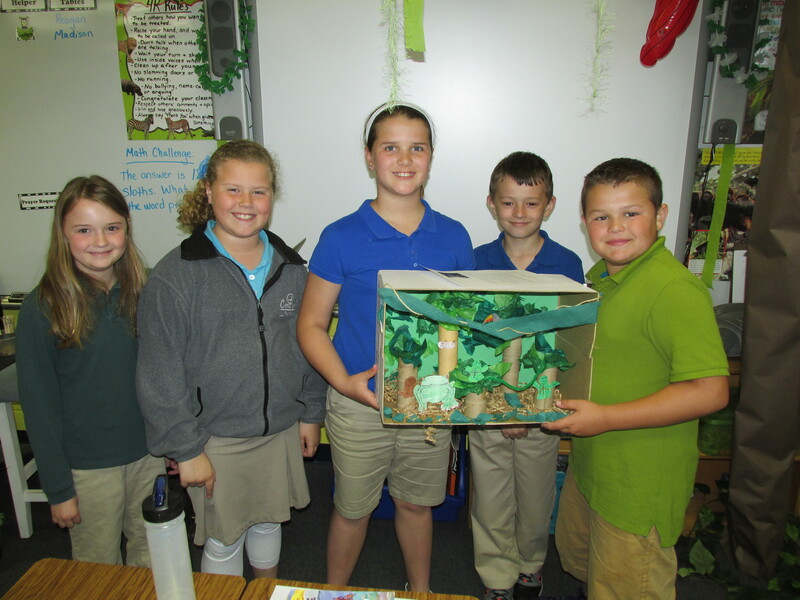 …and Rainforest Animal Research Projects. 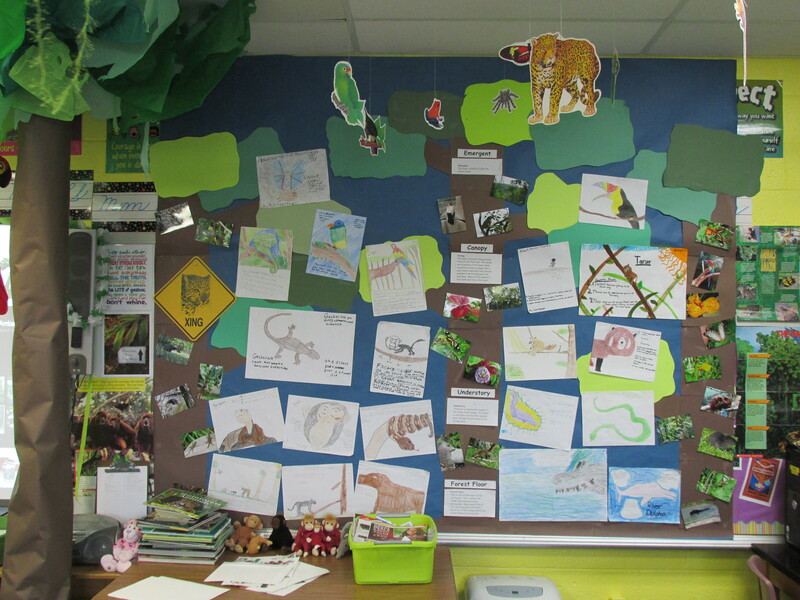 For these, students chose an animal that lives in the rainforest, researched their animal to find at least 3 interesting facts, and then drew a picture of their animal (and wrote the facts on the paper) that we added to our 4R Rainforest Wall.